Coins Remembered / Gift Ideas. "Birds of Prey" Gift Box. Perth Lunar Goat Gift Box. BOLD Set: Around the World 2017 - 8 Coin Collector Set. BOLD Set: Around the World 2017? BOLD Collector Sets feature single coins while BOLD Stacker Sets include tubes of each coin in the set. BOLD Sets are also a great gift option for that special coin collector in your life. Check back often as we add new sets regularly! This BOLD Collector Set features 8 of the most popular legal tender bullion coins in the world released in 2017! With a total of 7.96 oz. 999+ fine silver, the releases include. 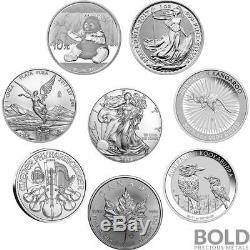 2017 Silver Great Britain Britannia? The 2017 Britannia 1 oz Silver Bullion Coin contains one troy ounce of. The purest of silver released by The Royal Mint. In honor of the 20th anniversary of the first release of this series, a new design of both sides of the coin are being introduced. The obverse displays a new, right-facing profile of Her Majesty Queen Elizabeth II. The artist, Jody Clark's 2015 design was selected to replace that which was first introduced in 1998. This is quite an honor for the artist, as this is only the fifth such portrait to be introduced into British coinage. The reverse also is updated, still featuring the helmeted Lady Britannia. She stands with a trident grasped in one hand to defend the seas, and in the other, a shield, graced with the image of Great Britain's flag to defend the realm. As a symbol of strength and integrity, Britannia has for centuries been featured on British coinage. She is encircled with the inscriptions, Britannia? New for this year, a radial sunburst design has been added to the background, providing a very attractive texture as well as anti-counterfeiting security. 2017 Silver 1 oz American Eagle BU. The Silver Eagle is the most popular bullion coin in the world. This stunning Silver bullion coin is a valued investment for its 1 oz metal content, beautiful patriotic design, and government guarantee. America's finest silver is displayed in all its glory with the 2017 American Eagle Silver Dollar. 2017 Silver 1 oz Australia Perth Kangaroo. The Perth Mint is proud to release the 2017 Silver Australian Kangaroo 1 oz coins. 999 fine Silver, this Australian Silver bullion coin is a treasure for investors as well as collectors and has proven to be popular worldwide since its release. The 2017 Silver Kangaroo features a gorgeous design, first introduced in 2016. The obverse of the coin bears the Ian Rank-Broadley likeness of Her Majesty Queen Elizabeth II and the face value. The reverse side features the classic Red Kangaroo design by Dr. Stuart Devlin, surrounded by a radiating design, along with a micro-engraved "A" appearing under magnification. 999 fine silver Austrian Silver Philharmonic is one of the most popular silver coins on the bullion market. Competing closely with the United States Silver Eagle, this bullion coin has been made since 2008. This beautiful 2017 Silver Austrian Philharmonic coin is in Brilliant Uncirculated condition, allowing the well-known design to shine through, also making this unique Silver bullion coin an ideal investment. Celebrating Austria's renowned cultural heritage of fine contributions to world music, particularly that performed by one of the world's most well-known orchestras, the Austrian Philharmonic, The Austrian Mint proudly continues this stunning series. 2017 Silver 1 oz Canada Maple Leaf. Since its introduction in 1988, the iconic Silver Maple Leaf (SML) has been a highly sought-after Royal Canadian Mint bullion investment coin. This 2017 SML is minted with one troy ounce (31.11 grams) of. 9999 pure Silver Maple Leaf Bullion coins produced for 2014 and beyond will have two new and unique features for enhanced security. 2017 Silver 1 oz Mexican Libertad. Minted by the Mexican Mint (founded in 1535), the 2017 1 oz. 999 Silver Mexican Libertad is an excellent addition to this series, which was introduced in 1982. The obverse side features a relief design of the National Coat of Arms, displaying a Mexican golden eagle devouring a rattlesnake. Encircling the central shield is the inscription, Estados Unidos Mexicanos. Surrounding the shield are ten distinct, and smaller shield versions. The reverse design displays the figure of the Winged Victory standing, wings outstretched, upon a pedestal. This historical symbol hails back to the Mexican Revolution. 2017 Silver 1 oz Australia Perth Kookaburra. The 2017 issue of this popular Perth Mint series displays a beautiful representation of this amazing bird. The laughing kookaburra, the largest member of the kingfisher species, is synonymous with the Australian bush. These coins are minted in. Part of Perth Mint's Wildlife series, the coin? S obverse side bears the Ian Rank-Broadley likeness of Her Majesty Queen Elizabeth II and the 1 Dollar (AU) face value. This year's reverse side features two Kookaburras; one larger, and more mature and a second smaller, looking up at the older. They are perched together on a wooden fence. Also included are the inscriptions, "Australian Kookaburra, " the date, weight and purity, and the Perth Mint "P" mintmark. 2017 Silver 30 g China Panda. China first introduced the Silver Panda coin series in 1983, and every year since, a new design variation of the Panda has been released. This 2017 is a beautiful example of the unique designs, which have made the series very popular among collectors and investors alike. The brand new 2017 reverse design features a beautiful single, Giant Panda clasping a bamboo branch. In the background is a wall of bamboo shoots, something that has been used in previous editions. On the obverse, the Hall of Prayer for Abundant Harvests in the Temple of Heaven in Beijing with the phrase, People's Republic of China, in Chinese around the edge, complete with the year of issue, 2017. The item "BOLD Set Around the World 2017 8 Coin Collector Set" is in sale since Friday, August 18, 2017. This item is in the category "Coins & Paper Money\Coins\ World\Collections, Lots". The seller is "boldpreciousmetals" and is located in Austin, Texas. This item can be shipped to United States, Canada, Australia, Germany.